Make a fun-filled splash with the entire family with a vacation at one of New York's water parks! Cool off this season at Darien Lake, Buffalo&apos;s largest water park, where thrill rides, kiddie waterslides, and a waterfront boardwalk reflect the nostalgia of a 1950&apos;s lakeside resort. A Long Island favorite, Splish Splash features high-speed tube rides through total darkness, water coasters, and near-vertical free falls. Ride a double-tube down a 100-foot drop into a swirling splash pool at Enchanted Forest Water Safari in the Adirondacks. In the Finger Lakes, Roseland Waterpark boasts a water playground, a near-vertical free fall slide, and more. For New York&apos;s only zero-gravity water ride, visit SplashDown Beach in the Hudson Valley. 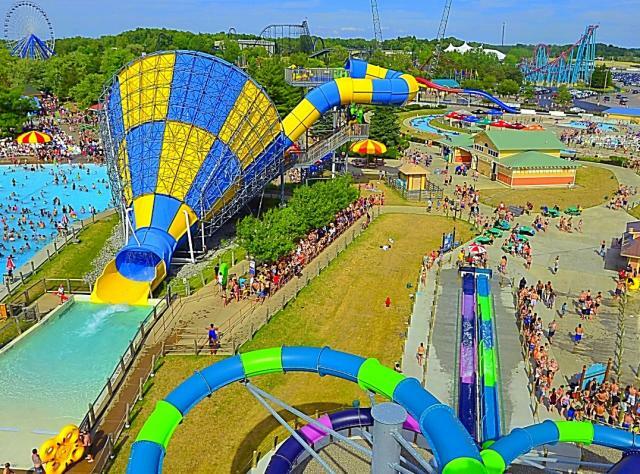 Home to the world&apos;s largest water park zip line—more than 100 feet high and spanning the entire vicinity—Zoom Flume Water Park also has a lazy river and an interactive Grand Prix Splashway. When the weather draws you inside, visit Six Flags Great Escape Lodge & Indoor Waterpark where whitewater-rafting, tubing, and slides abound at a balmy 82 degrees year-round. Dive into New York State&apos;s water parks!